SIMPLY is returning to Orange County for a chic afternoon at Fashion Island, celebrating all things fashion and beauty. Listen in on informative panels featuring all your favorite fashion and beauty experts, shop the latest fall fashions at the in-store parties, and enjoy stylish treats & activities, all at StyleWeekOC®! This fashion-forward event hosted by Anthropologie and fashion influencer, Amanda Nguyen from Feast.Fashion.Faves (@FeastFashionFaves) will feature a variety of the top fashion trends of the season. The Splendid Warehouse Sale is coming to Alternative Retail in Santa Ana this Thursday 6/14 through Sunday 6/17! Splendid is clearing out their warehouse and sending it to us! We will be putting out all your favorites at huge discounts! Shop styles from Splendid starting at $10! *Visa, Mastercard, Debit & Cash accepted. No backpacks or large bags inside. Please do not wear SPLENDID to the event. We reserve the right to refuse service to anyone. ALL SALES FINAL. NO RETURN/EXCHANGES. Prices subject to change. Some Exclusions apply. SIMPLY is heading back to the Big Apple for an unforgettable conference experience during the most exciting time of year: New York Fashion Week. Love fashion and beauty and want to learn the tips, tricks, and how-to's? Aspiring to be a blogger, stylist, entrepreneur, fashion designer, or editor? Already work in the industry and trying to grow your business and network? Guess what...if you answered YES to any of these questions, this conference was built for you! SIMPLY NYC is a place to learn, network and get inspired as you enjoy a day full of panels and breakout sessions presented by the influencers who are making major waves in the worlds of fashion, beauty, blogging and tech. Cocktails, pampering, meet & greets and photo booth fun are always right around the corner, at our signature Brand Experience! Want to experience the excitement of Simply NYC and explore (and shop) your way through the brand activations? Our Social Butterfly Ticket allows you to experience the conference buzz and networking opportunities. Please note you will NOT have access to panels or breakout sessions with a Social Butterfly Ticket. 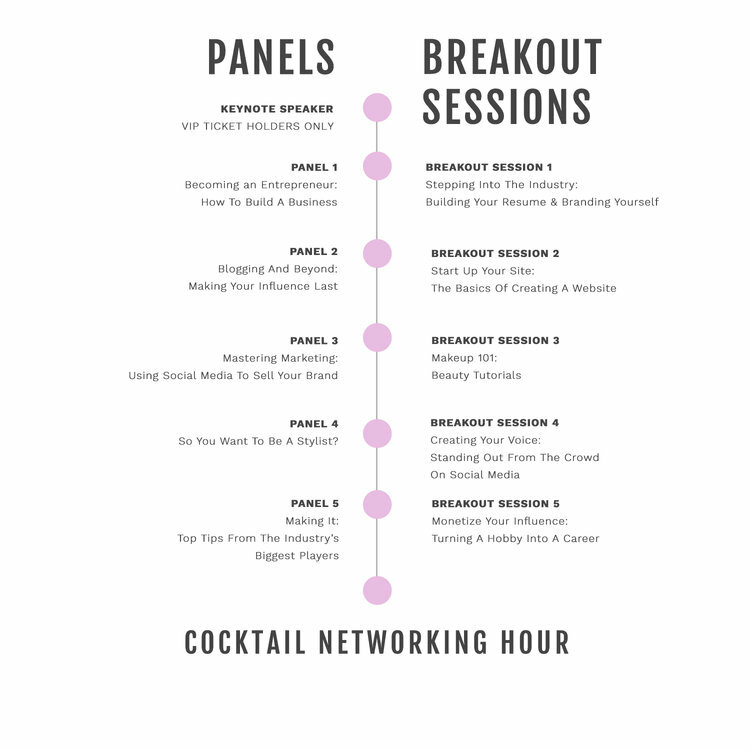 *IN ORDER TO ATTEND THE PANELS AND BREAKOUT SESSIONS YOU MUST HAVE A GA OR VIP TICKET.